Spartacus, Princess Leia, James Bond, Batman: These are just a few of the heroes who have been admired and musically staged by composers such as Richard Wagner, Stephen Melillo or John Williams. Together with the Freiburg Wind Orchestra, the Collaborative Research Center (SFB) “Heroes – Heroizations – Heroisms” at the University of Freiburg has created a combination of knowledge transfer with music in the symphonic concert “Hearoes”, presenting heroes from literature, cinema, opera, antiquity and modernity in musical and non-musical form. In the video, Prof. Dr. Ralf von den Hoff and Prof. Dr. Joachim Grage from the SFB will explain beforehand how the portrayal of heroes has evolved over time. 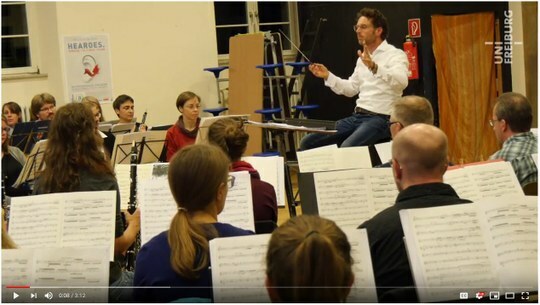 The concert will take place on November 18, 2018 at 6 pm in the Freiburg Konzerthaus. Stefan Grefig will conduct the orchestra that evening; Prof. Dr. Thomas Seedorf from the SFB will introduce the audience to the historical and musicological background. Admission costs 19 euros; reduced tickets are 16 euros. Tickets are available from Badische Zeitung, Musikhaus Gillhaus and www.reservix.de.